The year was 1938, and a delivery truck driver for Hormel Meats named Braxton Schuffert stopped by the boarding house of Lilly Williams in Montgomery, Alabama to make a drop off. After unloading the parcels, Braxton Schuffert noticed a 1/2-sized guitar sitting in the corner, and took a moment to pick out a few songs before continuing on his route. “Hiram, he’s got you beat,” Miss Williams called out to the back room to a 15-year-old boy. What transpired next would help result in that 15-year-old boy becoming country music’s first superstar. One of Hank Williams’ first songs “Rockin’ Chair Daddy” was co-written by Schuffert. As Hank began to get bigger, Braxton helped form Hank’s Drifting Cowboy band, and was a revolving member of the band and was part of Hank’s inner circle throughout the country star’s career. On January 30th, 1952, when Hank needed a ride to play a New Year’s show in Canton, OH, Braxton Schuffert was the first person he asked. But Braxton couldn’t do it. Because even as Hank Williams rose to the very heights of stardom, Schuffert stayed in Alabama, loyal to Hormel where he worked for over 42 years. 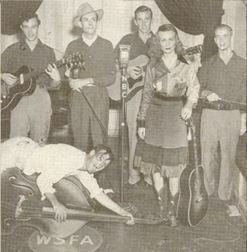 Hormel was the sponsor of that WSFA radio show Hank Williams made his first appearance on, and another show on WCOV Schuffert performed on. Hank would never make it to Canton, OH. He died in the back of his powder blue Cadillac in Oak Hill, West Virginia. Braxton Schuffert was one of the principal pall bearers at Hank’s funeral. 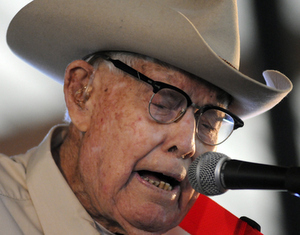 Braxton Schuffert was his own accomplished country music singer, and worked to help keep the legacy of Hank Williams alive, performing as lately as last year’s 33rd annual Hank Williams Festival in Georgiana at the age of 96. Schuffert has his own display case at the Hank Williams Museum. Braxton Schuffert passed away on Friday, April 26th, 2013. He was 97. The fiddle at the beginning of that song made me think of Why Don’t you Love Me by Hank. That is an interesting article. I am a big hank Sr fan. I love his music and I have learned to sing and play some of his songs. I have almost every song he recorded. Great article. Sadly without writings like this one, the passing of this gentleman, who played such a critical role in the the career of Hank would go largely unnoticed. Thanks. And it doesn’t help that his death was so overshadowed by the passing of George Jones. I didn’t find out about this until today, and so far it is only being covered by local outlets in Alabama. I had never heard this story thanks for sharing it! Thanks for starting my Monday off with a smile and a bit of a nostalgic happy/sadness missing my wonderful father in law who sang and picked like an angel and dearly loved Hank and I bet he knew about Mr. Schuffert. Shades of that soul wrenching music we always felt with Hank in this song. Hank was the best ever, period. I’m not surprised that he had some help along the way. Hank spent his last night on this earth (December 31, 1952, I believe) at the Andrew Johnson Hotel in downtown Knoxville, about 2 blocks from where I work. It’s just another edifice to most people, but, to me, it’s hallowed ground. I hope to make it to Hank’s grave one day. This was new information to me thanks for the post. Beth, take a joke. Its the internet. I wasn’t even giving credence to this rumor, just making a cheap joke. Nevertheless, I’m sorry my joke offended you, but I am more sorry that a manager of a Hank Williams Museum doesn’t know about this. At least refute it with evidence, evidence that you should have. Have a nice day. Long live HANK!!!! Davey, I understand it was a joke, and many of the readers of SCM I’m sure saw it as a joke. But you have to understand that certain articles, especially one like this are going to attract certain readers who may not either 1) Be so well-versed on the internet as you or I. 2) My be much older, or much younger, where that type of language is not appropriate. 3) May have a different value system than you. So though I appreciate your apology and I think we all need to realize we are all Hank Williams fans here, it’s not really Beth Petty’s obligation to “take a joke.” It is ALL of our obligations to show respect to each other, especially surrounding a somber subject such as this. I completely understand, it was a little disrespectful considering the timing and subject matter. Braxton deserves all the respect in the world! As soon as I heard the news from Keith Neltner, [because of the respect I have for Schuffert] I spent a couple hours reading articles, listened to two long form interviews, and delved into his music (the little I could find) contemplated Don Helms steel being used in a few songs I heard. Also, the steel in this song and Rockin Chair Daddy sounds a bit like Don Helms, can anyone confirm? Great article. It’s a shame I’d never heard of this fellow until he passed. Being an Alabamian, I hear lots of tales about hank sr., but it’s hard to know what’s true and what’s not. Are there any good books out there on hank sr worth reading? Braxton Schuffert was my grandfather and he was always a gentleman. He taught me how to play guitar and I sang with him and my grandmother Ola Schuffert as we were growing up. Thanks for keeping the memories alive as he is greatly missed by all. Braxton Schuffert is my family I believe he was my Uncle. I knew he did lots of work and singing with Hank Williams but didn’t know all of this. It’s great when you come across auxh neat little tid bits about something that happened in your family so many years ago and people in today’s times are still talking about it. Thanks for sharing, and if you have anymore information on Braxton Schuffert’s life and career with music or any kind of work he did I would love to hear about. So whoever man’s this page or site if you have any more information or pictures please share with my email address is doodabug1973@gmail.com. feel free to share anytime.